Europe's Large Hadron Collider (LHC) has produced record-breaking high-energy particle collisions. Scientists working on the European machine have smashed beams of protons together at energies that are 3.5 times higher than previously achieved. Tuesday's milestone marks the beginning of work that could lead to the discovery of fundamental new physics. 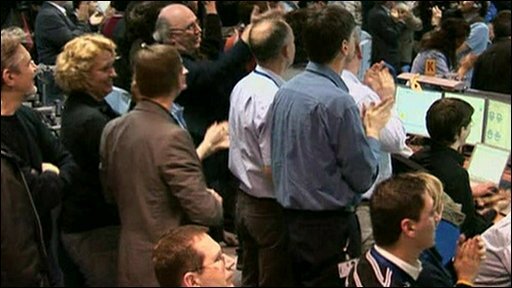 There was cheering and applause in the LHC control room as the first collisions were confirmed. These seven-trillion-electronvolt (TeV) collisions have initiated 18-24 months of intensive investigations at the LHC. Scientists hope the studies will bring novel insights into the nature of the cosmos and how it came into being. Many of them have described Tuesday's event as the beginning of a "new era in science". But researchers caution that the data gathered from the sub-atomic impacts will take time to evaluate, and the public should not expect immediate results. "Major discoveries will happen only when we are able to collect billions of events and identify among them the very rare events that could present a new state of matter or new particles," said Guido Tonelli, a spokesman for the CMS detector at the LHC. "This is not going to happen tomorrow. It will require months and years of patient work," he told BBC News. The LHC is one of the biggest scientific endeavours ever undertaken. WHAT IS AN ELECTRON VOLT? Housed at Cern (the European Organization for Nuclear research) in a 27km-long tunnel under the Franco-Swiss border near Geneva, the LHC successfully collided particle beams travelling at close to the speed of light. The expectation is that previously unseen phenomena will reveal themselves in the resulting debris, with a key objective being the search for the much talked-about Higgs boson particle. This is thought to have a profound role in the structure of the Universe, and would enable scientists to explain why matter has mass - something which, at a fundamental level, they have difficulty doing at present. Cern's director general Rolf Heuer said: "It's a great day to be a particle physicist. "The LHC has a real chance over the next two years of... possibly giving insights into the composition of about a quarter of the Universe." 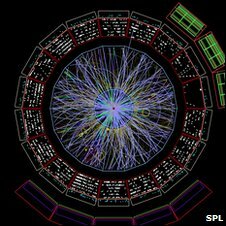 The LHC broke down shortly after its opening in 2008 but, since coming back online late last year, has gradually been ramping up operations. Two proton particle beams have been circling in opposite directions in the magnet-lined tunnels at 3.5 TeV since 19 March. The LHC's four major experiments - its giant detectors Alice, Atlas, CMS and LHCb - have now begun to gather their first physics data from the collisions, a development that Cern described as an "historic moment". "If you want to discover new particles, you have to produce them; and these new particles are massive. To produce them, you need higher energies. For the first time [on Tuesday], we will be producing particles that have energy 3.5 times higher than the maximum energy achieved so far. "This is why we can start the long journey to make major discoveries in identifying a new massive state of matter." At the end of the 7 TeV (3.5 TeV per beam) experimental period, the LHC will be shut down for maintenance for up to a year. When it re-opens, it will attempt to create 14 TeV events.